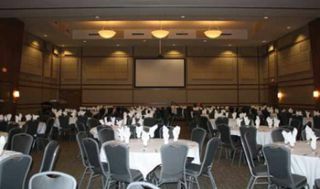 The Kimberley Conference and Athletic Training Centre’s vast ballroom is equipped with Primacoustic panels to reduce room echo. VANCOUVER, BC, canada—What started out as a Paralympic training center with funding from the 2010 Winter Olympics in Vancouver, the Kimberley Conference and Athlete Training Centre (KCATC) was developed into a full-scale conference and athletic training facility. Early on in the planning phase, business-savvy local integrator John Siega recognized the opportunity for an advanced AV contract at the site. Designed to accommodate banquets of up to 390 people and theater-style meetings of up to 500, the center also features four breakout rooms for smaller meetings of up to 49, in addition to the main ballroom and pre-function space. All conference rooms are equipped with AV. Siega Productions went to work in two phases: designing and installing the AV systems and supervising acoustic treatment in the ballroom and pre-function areas, Siega said. “The audio consisted of a distributed system with the flexibility of sound being delivered from any room in the facility to any other room in the facility,” he explained. “This consists of ceiling- and wall-mounted speakers with the ballroom speakers, and amplification more along the lines of a traditional PA system,” with larger speakers and power amps, as well as full stereo capability. Sound distribution is controlled by dbx ZC-8 controllers and dbx Zone Pro processors, which “can be PC controlled via the in house network, so room by room adjustments can be made without localized mixers,” Siega said. This is “a user hands off approach to the design.” The ZC-8 controller is wall mounted, with relatively small controllers that can control volume and input selection—up to four—which can be preset for events. Shure wireless mics round out the audio system. Video is localized with Dell projectors and Draper screens in each breakout room, while 15- by 7.5-foot, 16:9 Draper screens and Sony projectors equip the 5,500-square-foot banquet hall. All the video is also network compatible. The ballroom has hard walls and ceilings but carpeted floors. With eight 12-inch drivers mounted in the ceiling and pointed down toward the floor, there was significant echo: seven to eight seconds in the ballroom and nine or 10 seconds in the pre-function area. The echo was evident even without the sound system. As a result, the ballrooms and pre-function areas received acoustic treatment with Primacoustic Broadway panels installed by New Dawn Developments as directed by Siega Productions. They had just a few weeks to complete this phase of the project. “Fitting all the panels was a big challenge,” Siega said. But well worth it. “The results are so stark, compared to the untreated venue, that it is sometimes hard to believe these are the same rooms,” he said. Lindsey Snyder is the assistant editor of SCN.